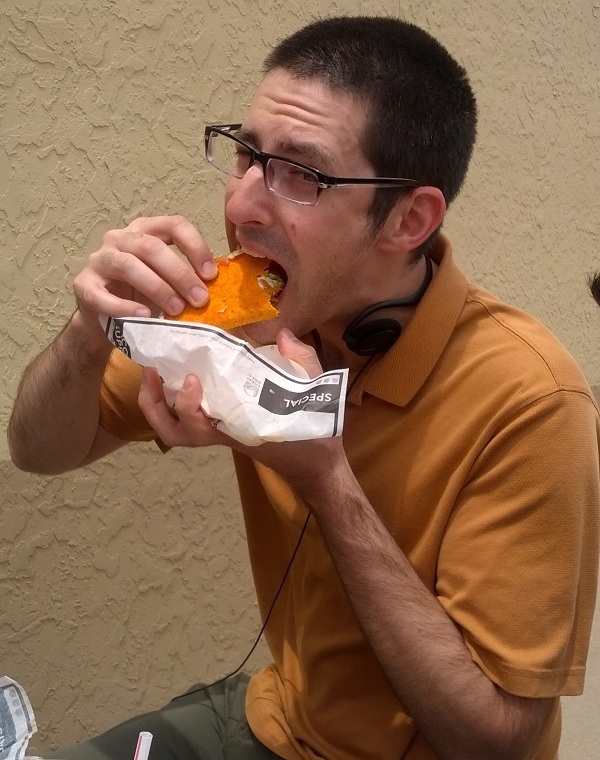 Normally I try to eat food, but today I deigned to eat a delicious edible nonfood product called Doritos Locos Tacos, sold in Taco Bell "restaurants" everywhere. The tacos were delicious, no doubt about it. I ate a trio of the "supreme" variety, which apparently means it has slightly more junk along with the meat-similar filling, although to be honest I could hardly imagine a version of the food item without those things; even with them, the taco was puny and underfilled. The taco shell, however, was an epiphany! How the heck did humanity make it to the year 2012 without taco shells covered in artificially flavored, artificially colored, powdered cheeselike seasoning? Someday we will all sit down with our children and explain to them "Son, daughter, there was a day when taco shells didn't have any sprinkly orange dust on them." They won't believe us. Even says "special" right on the wrapper. Must be awesome.